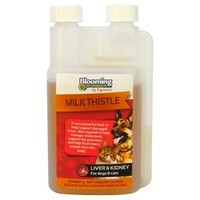 Equimins Blooming Pet Milk Thistle Liquid is a very powerful solution to help support and cleanse damaged livers. Regular use of the liquid will support the natural detoxification pathways of the liver; promoting the overall health of the liver and enhancing the vitality of your pet. Recent studies also suggest that Milk Thistle extract can help manage cholesterol, support the pancreas against diabetes, protect the kidneys and help flush heavy metals from the body.